Dr. Bagheri serves on the editorial board for the OMS Knowledge Update: a publication by the American Association of OMFS. Due to the recent release of Windows 10 and the Edge Browser, Centrax has delayed the release of the Reconstruction chapter to insure full compatibility with these new Microsoft products. We expect Reconstruction to be live by mid-October. A full listing of OMSKU V authors is now available here, allowing for easier recognition. 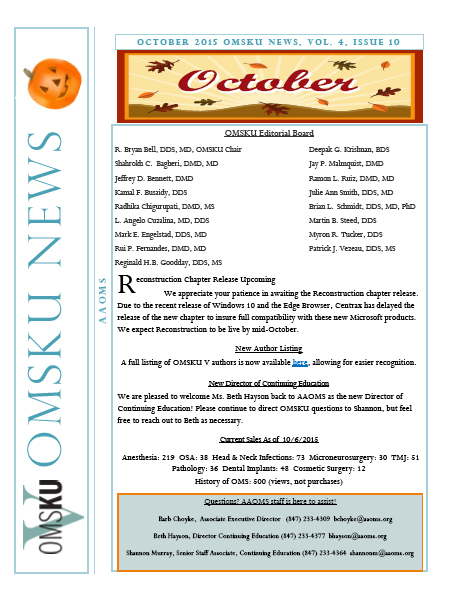 To view the OMS Knowledge Update October newsletter, click here.